April 20, Democratic businessman Mike McWherter rolled out a daily news service for Tennesseans looking for news that covers the fight to provide opportunity for all Tennesseans. We’re excited that Mike is using his strong voice to speak to these important issues. Tomorrow you will be receiving a daily e-mail from me titled “Out of the Blue.” It is designed to summarize the “Daily Buzz” of events happening around the state. It is not designed to be an “editorial,” but rather a short version of comments by others from around the state on current affairs. Of course, with the legislature in session, many of the comments will center on their activities for now. My hope is this information will be useful in generating “coffee shop” talk throughout our state and provide you with commentary to engage in meaningful dialogue with your friends and acquaintances. Please feel free to forward this information onto others with whom you wish to share. During my campaign for Governor, I realized a need to capture traditional and new media content in an easily accessible format to measure the thoughts of various constituencies. I am truly grateful to my supporters from the gubernatorial campaign, and in launching this communication tool, my goal is to help keep them informed. Many of you may be like me in finding it difficult to have the time to navigate all the different sources available online. This is an attempt to summarize the “daily buzz” from around the state. Trace Sharp, former newspaper editor and social media expert, has graciously agreed to staff this effort. I hope you find it useful and informative. So many candidates walk away and “fold the tent” following their races. I want to remain an active Democrat and do everything I possibly can to promote the values our party. Due to the recent illness of my father, Governor Ned McWherter, we were forced to delay this venture, but now we are moving forward. Let me assure you, this is not an attempt to usurp any efforts by our leadership, but merely to help enhance communication efforts. United we can stand and develop an environment in our state which serves everyone, not just a privileged few. To sign up to receive Out of the Blue use the form on the right. Friday, April 29, 7:30 a.m. – 9 a.m.
FREE for Finance Council & Governors Roundtable members plus guest. Finance Council members give $1,000 a year to the TNDP. Payment plans of $250/quarter or $85/month are available. 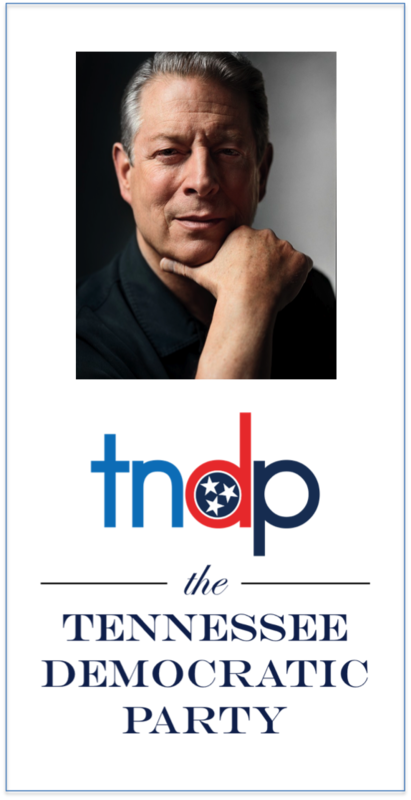 For more information or to RSVP, please contact Lee Levine by email at lee@tndp.org or call (615) 327-9779. You are currently browsing the archives for the mike mcwherter category.